A new appearance in the Rouleur online shop this week attracted my attention and also reminded me of something similar – and equally beautiful – that has been around around for a little while..
Two different takes of a poster of various cycling jerseys. The limited edition Rouleur version (£45.00, A2 sized), by illustrator Beach, chronologically details the jersey’s of the 101 Tour de France winners in an attractive flat graphic style whilst David Sparshott’s (£55, A2 size) pencil crayon sketches capture a wide range of vintage jerseys in his signature style. Both prints are very simple and just let the beauty of the jerseys – and the magic of a bit of repetition – do the hardwork. David has a deal on at the moment for two A2 prints for £100. If you are tempted by the jersey one I would suggest that the vintage cycle teams cars print would be an excellent pairing. 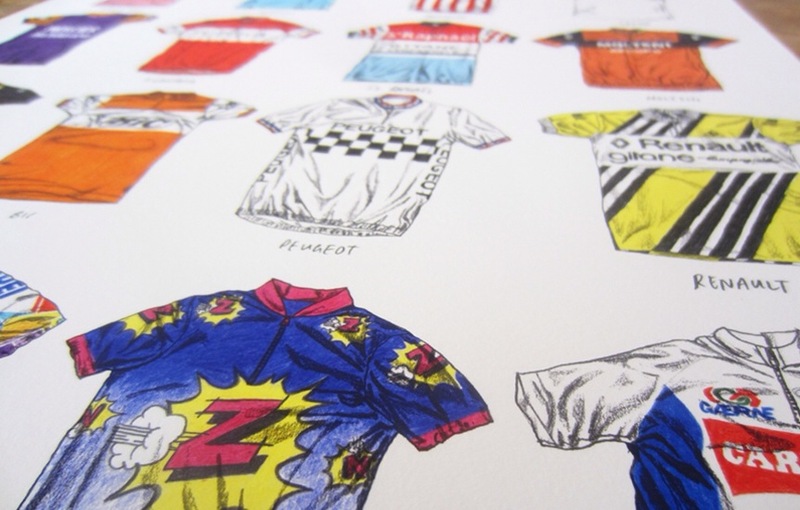 Check out my Jersey Pocket Podium of classic cycling jerseys, which also features David’s illustrations, here. This entry was posted in Product Reviews and tagged Art, Cycling, jerseys, rouleur, sparshott, vintage. Bookmark the permalink. 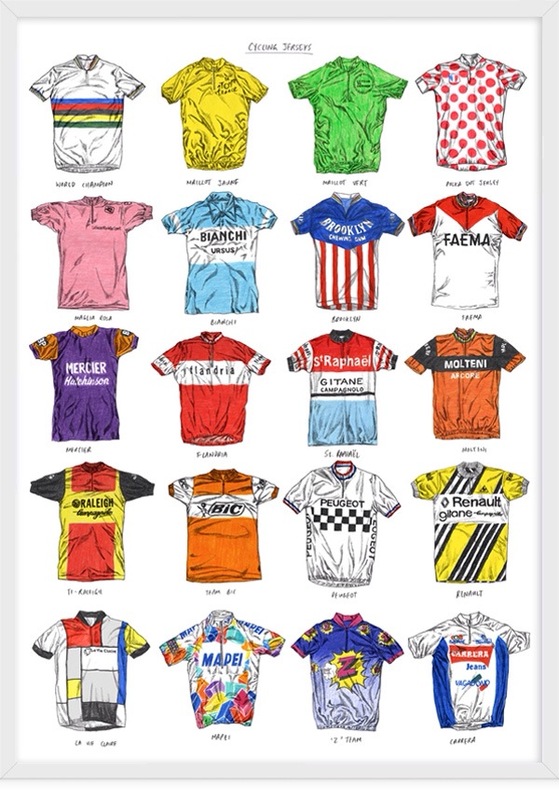 ..but I actually was looking for this great poster of David Sparshott ‘cycling jerseys. Which i would really like to give to my best friend as a birthday present and therefore am interested in the deal of £100 you were suggesing above? How and where could I order? !